The 24K Collagen Collection works to plump the appearance of dull, sagging skin, while promoting a brighter, more radiant look. 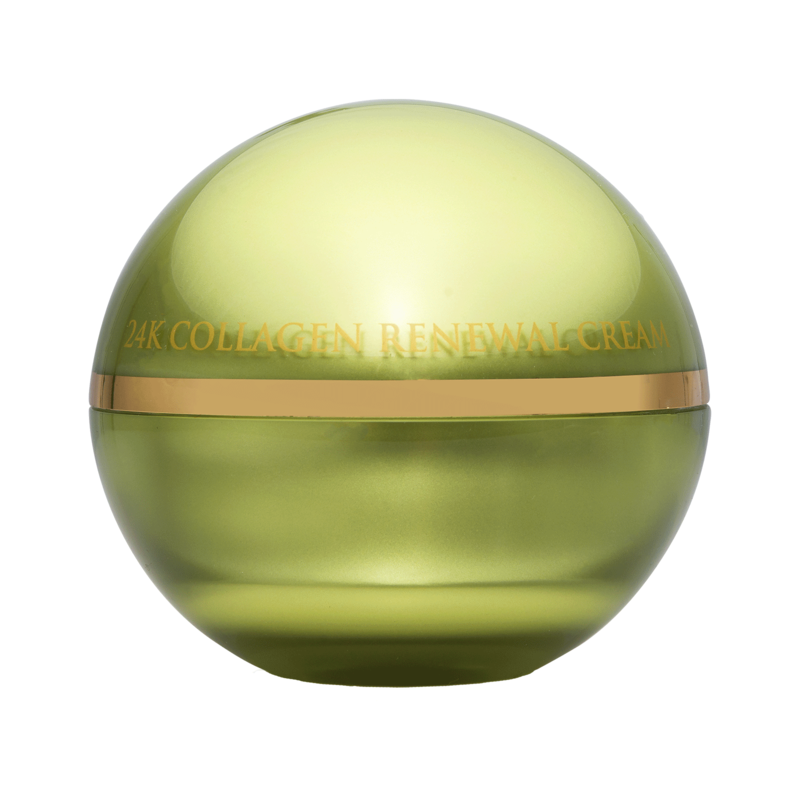 The 24K Collagen Renewal Cream's unique formula helps to improve the appearance of skin firmness and restores lost moisture. Visibility of fine lines and wrinkles are also reduced with continued use. This cream's feather-light texture instantly melds onto the skin, increasing radiance and vitality.Enriched with seaweed extract, green tea and aloe to leave your skin feeling soft and looking radiant. The 24K Collagen Renewal Cream effectively brightens the look of your skin while reducing the appearance of lines and wrinkles. -Apply daily on freshly cleansed skin as part of your facial routine. -For ultimate results, use in conjunction with 24K Collagen & Seaweed Mask and over 24K Collagen Renewal Serum. Aqua, Carthamus Tinctorius (Safflower) Seed Oil, Isopropyl Palmitate, Cocos Nucifera (Coconut) Oil, Glycerin, Propylene Glycol, Cetearyl Alcohol, Glyceryl Stearate, Peg-100 Stearate, Ceteareth-20, Stearic Acid, Myristyl Myristate, Cetyl Alcohol, Gold, Retinyl Palmitate, Tocopheryl Acetate, Ascorbic Acid, Camellia Sinensis (Green Tea) Leaf Extract, Calendula Officinalis Flower Extract, Aloe Barbadensis Leaf Extract, Laminaria Japonica (Seaweed) Extract, Olea Europaea (Olive) Fruit Extract, Citrus Limon (Lemon) Fruit Extract, Saccharum Officinarum (Sugar Cane) Extract, Citrus Aurantium Dulcis (Orange) Fruit Extract, Acer Saccharum (Sugar Maple) Extract, Malic Acid, Lactic Acid, Dimethicone, Beta-Glucan, Collagen, Sodium Hyaluronate, Acrylates/C10-30 Alkyl Acrylate Crosspolymer, Carbomer, Sodium Hydroxide, Phenoxyethanol, Ethylhexylglycerin, Parfum, Ci 19140, Ci 42090.